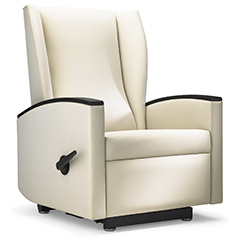 Culla gives patients and guests multiple ways to position themselves comfortably. Upright, it’s a glider ready to be set into soothing motion. Tilted back, it’s a relaxing recliner where people can rest or put their feet up. The high back and curved arms provide full support while sitting or moving in and out of the chair.